Jerez Airport is the main airport for the Costa de La Luz and is located 5km north of the city of Jerez and is east of the NIV road to Seville. It handled 1,079,787 passengers and 43,327 flights in 2009. The airport at Jerez is small and compact, with facilities located over two floors. The airport has a cafe area in the public area which is located on the upper level, a smaller cafe is located in the departures lounge, and just before the security and passport checks is a small shop offering gifts and daily international newspapers. A duty free shop is also available in the passenger zone. Car Hire at Jerez Airport: There are five main car hire companies operating at Jerez Airport. Before booking you car you should read more about our experience with car hire at Jerez Airport. The main companies are: AurigaCrown at Jerez Airport – Avis at Jerez Airport – Europcar at Jerez Airport – Goldcar at Jerez Airport – Hertz at Jerez Airport – National Atesa at Jerez Airport. All of the above companies have offices which you will find within the airport terminal between the arrivals and departures hall. Crown hire car and National Atesa also offer car rental at Jerez Airport and although you can collect and leave the cars at the airport they don’t have fixed offices. Another large company that operates out of Malaga, Niza car rental, have also just purchased a large plot of land on the outskirts of the airport so its safe to assume that they are expanding into Jerez Airport. Jerez Airport private transfersJerez Airport is the principal airport for the Costa de La Luz and apart from the City of Jerez you can also easily get Jerez transfers to Seville, Tarifa, Chiclana, Algeciras, Gibraltar and Cadiz. In fact it is only a 75 minute drive from Marbella! If you find the cost of a private transfer a bit expensive you might like to consider booking a seat on a private shuttle bus which stops at a number of places in the Jerez area. You can fly into Jerez Airport from the UK and Germany. Internal Spanish flights are also available from Barcelona Airport, Palma Airport and Madrid Airport. In fact there are around six flights per day over the summer between Madrid and Jerez. Arrivals at Jerez Airport: The main Jerez Airport Arrivals hall is on the ground floor and as you enter the hall there are double doors directly in front of you that lead to the taxi rank and bus stop. From the air side, passengers access the baggage reclaim hall through one of the two doors (domestic and international, the latter has a passport control) located at the end of the hall. There are three baggage carousels. Also located in this area on your left are car hire offices which operate in both the restricted and public areas. In the general hall there is also a tourist information service. Check Live Jerez Arrivals. There are several ways of getting to and from Jerez Airport. You can use one of the Jerez Airport Taxis, hire a car and drive yourself, or catch one of the new airport buses that have just started operating at Jerez Air port. There are no trains to and from the Airport. Fare 1: Monday to Friday from 07.00 to 22.00: approximate price to Jerez, €12.10 plus €0.42 per suitcase or piece of luggage; to Algeciras, €145.92; to Cadiz, €48; to El Puerto de Santa María, €25.92. Fare 2: Monday to Friday from 21.00 to 07.00, Saturdays, Sundays and bank holidays: approximate price to Jerez, €15.13 plus €0.42 per suitcase or piece of luggage; to Algeciras, €173.28; to Cadiz, €57; to El Puerto de Santa María, €30.78. A cheaper alternative is to reserve a seat on a private shuttle bus which stops at a number of places in the Jerez area. The Jerez Airport Buses run between Jerez Airport and Jerez City, Cadiz and Santa Maria. The first bus of the day leaves Jerez Airport at 0630 and the last bus leaves at 2230. We are hoping that as Jerez Airport gets more passenger traffic the local bus companies will start offering a service up to the Costa del Sol or at least down to Tarifa. Whilst there are no trains at Jerez Airport there are local Trains in Jerez and for the area of Cadiz. We have also written about using Trains in Spain to make your journey easier. Trains at Jerez AirportThere are no trains at Jerez Airport however there are local Trains in Jerez and for the area of Cadiz. We have also written about using Trains in Spain to make your journey easier. Parking at Jerez AirportJust in front of the Jerez Airport are the car parks P1 and P2. For both of these car parks the pricing is the same. P1 offers 420 spaces with and extra 186 for car hire. P2 offers 515 spaces. For the first half hour it is €0.45 then increases to €1.06 for next half hour and each subsequent hour is €0.98. The daily maximum for up to four days is €10.75 and from the fifth day it is €8.60. Shops at Jerez Airport: After you have checked in for your departure from Jerez Airport you will find a coffee shop and well stocked “Duty Free” shop in the departures lounge. The Duty Free Shop sells a small selection of wines, cigarettes, tobacco, toys, gifts etc. If you want a magazine or newspapers, buy them in the shop just before you go through to departures. 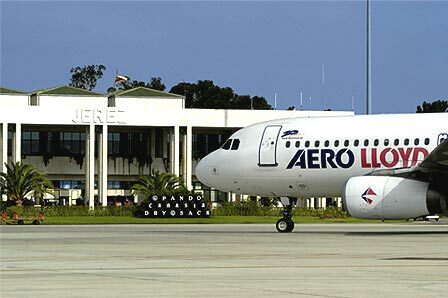 Jerez Airport driving directions: To find out just where Jerez Airport is located we have provided a location map and also Jerez Airport driving directions to help you get to your destination safely and quickly. Information on Jerez AirportTo make sure you get the most from your visit to Jerez, we have written a Jerez Area Guide detailing the best Shops in Jerez as well as Jerez Local Markets and Golf Courses in Jerez.. There is detailed information on the Jerez Beaches and recommended Restaurants in Jerez. If you want to find out something about the local culture and history of the area then visit our Jerez Local Attractions Guide. There are no left luggage facilities at Jerez Airport. In some ways the most important aspect of all, Jerez Weather gives you a full 3 day, 5 day and 10 day forecast with information on the year round climate in Jerez and the surrounding area. We have written a series of articles about Jerez and on Spain in general which we hope you will find interesting. Visit our Travel Articles on Jerez to find out more about day trips and weekend breaks in Jerez. If you are thinking of moving to the area we have provided details on how to obtain your Social Security and NIE numbers, how to fly your pets to Spain number and how to get a UK car registered over here.